I know you have been thinking about what to eat in celebration of St. Patties Day. My friend Jessica has the answer. Well for St. Patrick’s Day we went a little overboard at the grocery store and bought enough toppings for TWO pizzas, so this is the first, and we’ll be making the second one tonight. We have a lot of fun with these, and it’s a great motivator to try new and sometimes strange ingredients or combinations of things we might otherwise not have considered for our weekly pizza night. 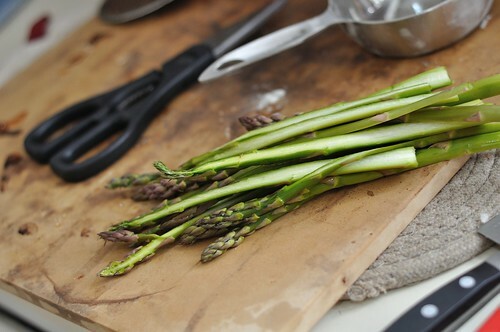 For our first pizza we chose fresh sliced asparagus spears and sliced red potatoes with carmelized onions and pesto. Lots of green and fresh spring vegetables. Ironic because it literally snowed all day yesterday. 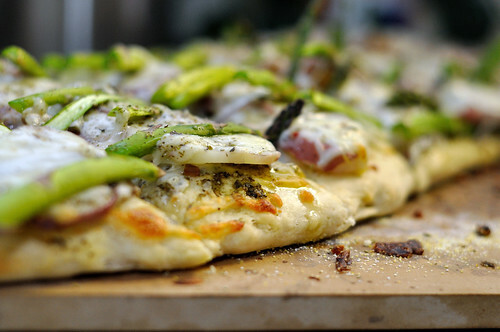 Regardless, a super fresh, green and veggie-filled pizza on a flatbread crust. This is our first time making a flatbread crust, so we gave the much-recommended Mario Batali Flatbread a try.